Stoughton Fletcher - "Fifth Beatle"
The Indianapolis Star article in attachment JackJohnson102709 was published October 27, 1909. Jack Johnson was one of the most compelling and historically significant sports figures of the 20th Century. He also had the heart of a racer. He was fascinated by fast cars, so much so that he would eventually die in one, his 1939 Lincoln Zephyr, as he sped along a North Carolina highway on June 10, 1946. Johnson made a brief foray into auto racing in an unsanctioned race meet with the most famous and sometimes notorious self-promoting racer of the day, Barney Oldfield. Despite his antics and a penchant for showmanship in staged races Oldfield was one of the best of his day. In fact Oldfield's interest in this event was a scheme to make money off of the attention it would draw and the rights his agreement gave him to the film he produced capturing the occasion. Oldfield's vast experience made the affair a lopsided contest and Johnson, while he still appreciated a fast car, never proceeded further with any notions of an auto racing career. Oldfield, seemingly always at odds with the sport's American governing body, the American Automobile Association (AAA) found himself suspended for yet again staging an unsanctioned race. As the first black heavyweight world champion boxer (1908 - 1915) Johnson was met with resentment and anger by the largely racist, white dominated American culture of the first quarter of the century. It does not take long perusing the microfilm of the era's newspapers to recognize a pervasive and radically different sensibility to mainstream media during the time compared to today. Open prejudice and stereotypical representations of black Americans were published daily in major daily newspapers. All the content, from news reports to the characters portrayed in cartoon strips presented black Americans in unflattering ways. This article discusses the intentions of Johnson to visit Indianapolis within a week of its publication. Henry K. Burton, manager of Indianapolis' Empire Theater had booked Johnson to appear there. This was typical entertainment in the day where major sports figures would appear on stage to perform some kind of exhibition and talk. In this case the Empire Theater was in a rough location and had a bawdy reputation. It's unclear if Johnson followed through with his plan to visit Indianapolis as it was not unusual for the newspapers to report on speculation that later never materialized. According to the article Johnson's manager, George Little, was not in favor of his fighter visiting the midwsestern capital. Little was in the throes of negotiating a title fight with the undefeated but retired champion Jim Jeffries. That fight would not take place for another year. With respect to Johnson's penchant for fast automobiles he had sent word ahead he intended to purachse a car while in the Hoosier city. Given the variety of automobile manufacturers in Indianapolis at the time - especially marques known for their performance - the city was a likely location for car shopping. Again it is hard to know if Johnson came to Indianapolis on this occasion. 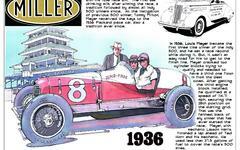 Another story of him visiting the city was that he was a guest of Indianapolis Motor Speedway President and Founder Carl Fisher and was driven about the track is probably pure folklore. There is no evidence that this actually occurred. In fact, when Fisher contemplated hosting Jackson to allow him to drive a few laps around the track as part of the Labor Day weekend race meet in 1910 the idea was met with such outrage by drivers such as Louis Chevrolet and Bob Burman that the Speedway's president backed off.